The Awa people have been described as the world's most endangered ethnic group. For years now they have faced the tribulations of disease and illness that come from initial contact with the outside world. This has been compounded by the illegal logging and torching of their forest in Brazil's portion of the Amazon. When they dare to stand their ground the reality of fighting guns and fire with bows and spears always pits the Awa against annihilation. A simple bow and arrow after all is no match for the modern firearms that the illegal loggers use to push Awa deeper into the forest. History has shown the Americas how this initial contact drama has played out in the past. When the Europeans came to the Americas the "virgin soil" epidemics spread a weapon far more fatal than their bullets could every be. Diseases, such as small pox, were utilized by Spanish, English, and French explorers who sought out gold, soil, and fame. These epidemics drastically culled the tribes as the white conquers continued to push westward. At times the biological warfare was all the Europeans needed to decimate given tribes. In the case of the Awa this phenomenon associated with initial contact cannot be documented for sure. We do not know how many Awa are still left uncontacted by the outside world. Therefore we cannot determine just how many will perish as loggers, trains, and oil corporations push their way into the rainforest. Yet if we look at the long and tragic history of tribal extinction in both North and South America we can see that the few who will survive will be a minute percent of how many Awa currently remain alive. Since the start of massive waves of illegal logging on Awa land the indigenous people have lost at least 30 percent of their forests. The loss of this timber contributes to reported hunger and starvation amongst Awa peoples. 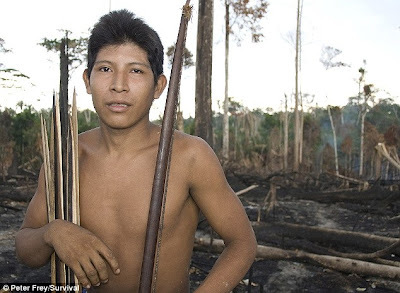 Without the cover of the forest the Awa people, who are nomadic and survive upon hunting and gathering, cannot find the game animals they traditionally hunt. If the animals the Awa need to survive are continually killed in massive amounts by outsiders (poachers and loggers alike) the Awa will suffer increased hunger. And with hunger comes desperation that could lead to more Awa being forced into contact with the outside world. For native peoples in North America hunger was used as a weapon to keep the population of the tribes on the Great Plains under control. Herds of buffalo were slaughtered intentionally as the government and private enterprise offered incentive by buying the hides at inflated prices. Railroads were then pushed out across the plains and as a result the buffalo were killed off at an ever increasing rate. This led to starvation and the displacement of countless tribes. Those who could no longer find food were offered by the United States cultural extinction through the reservation process. In Brazil the Awa are given limited legal protection. Their right to live in their homeland free and unexploited is left in the hands of a government that has struggled to muster the needed force to protect the Awa. Instead of offering reservations the Brazilian government has decided to attempt to isolate the Awa and keep their land free of invading settlers and outside companies. This however has been a failed policy. Hunger and disease have been spread rapidly among the Awa people. With the Vale railway company pushing to double it's railway tracks through Awa territory the threat of both hunger and disease increases. Campaigns to protest and block the company from expanding their destructive exploitation of Awa lands have seen no real gains as the Brazilian government looks the other way. In July of 2013 the Brazilian government did however deploy troops to the Awa lands where they were ordered to defend the rainforest at all cost. They were given permission to arrest loggers, illegal settlers, and poachers without restraint. Yet the campaign showed little effect as Awa were once again put in a position where likely contact with the outside world was drastically increased. The trade off in this push by Brazil was that logging camps, unlawful ranches, and poachers were temporarily pushed out while Awa were exposed to tanks, helicopters, and state troops. So what is the threat of contact exactly? With contact comes the loss of cultural identities that many in the outside world find almost valueless. Like tribes around the world, the Awa stand to lose their traditional way of life, their language, and their social structure. The push with contacted tribes has always been one of forced assimilation and the cultural genocide of native ways of life. This has been evident in contacted native populations across the Amazon. Brazil being no exception to this tragic reality. Contact with the outside world has also proven to be often more fatal than the world community first admits. From the 1980's, when Brazil first allowed the railway and mine constructions on Awa land, the workers for outside companies have committed countless massacres against Awa families. These atrocities have been committed in both efforts to push Awa out of their homes and to support other heinous crimes. Awa who are spotted by rail workers and loggers are therefore at risk of being shot on sight. Cattle ranchers have further shown why Awa people cannot trust outside invaders who show up on their lands. When cattle ranchers burn large portions of land they expose Awa to countless risk. Not only are Awa lives put at risk the animals that Awa both keep and hunt are endangered. Any Awa who are spotted during such activities are ran off or shot by ranchers who view the Awa as obstacles and not humans. Health, food, and freedom are all put at risk through contact. These are all three things that the Awa cannot get back once they adapt to life amongst the outsiders. The health care system that Brazil has put in place for the Awa would be laughable if it wasn't so tragically flawed. The food that Awa have enjoyed for generations cannot be supplemented by the outside world. And the freedom to maintain their way of life as the Awa people see fit is immediately lost when they surrender their lands to the state and corporations. All of this has left the world with one major question... how much is the preservation of a peoples' culture worth? Lumber, iron ore, and much coveted land are all on the table as corporations and private enterprise wring their hands while looking at the Awa people's forests. The greed of the developed world cannot be ignored as the world community watches the extinction of a native people. Though we have watched it happen time and time again, we must now ask ourselves if any of these things are worth the value of this priceless treasure... the Awa people and their culture. If we do nothing to stop the exploitation of the Awa we will watch as a portion of humanity's diversity is driven into history. Once the Awa are gone they will take everything they know with them. Every aspect of their lives, every aspect of their language, every aspect of their society will be lost for the rest of time. You can learn more about the Awa by visiting Survival International.